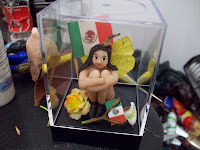 Guys, this week coming up I plan on being out street vending, I may decide to take the peeps to Union Square, but also want to venture to 59th street in front of the central park entrance. I will keep you posted. video of it up on youtube. 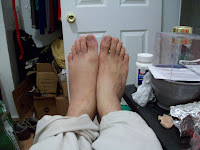 Hello everyone, I can confirm that I will not be at the 52nd association jazz festival tomorrow, Sunday the 26th due to my left foot having edema... oh joy. Warning, image may be slightly disturbing. 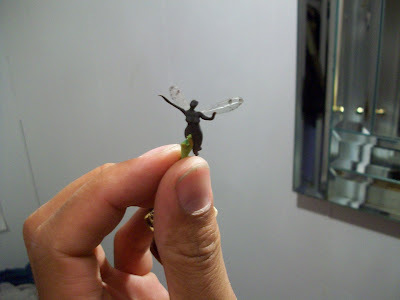 My boys mom had a little co-gin that i made her a couple of years back, and it recently was dropped and one of its middle fingers broke off, its red butterfly wings, and also the little stalk which was on its head. I could not open the case because I had glued it shut, the only thing to do was to break it open. Upon opening it, I was amazed that the little thing had been made by me, I haven't made co-gins in a long time so it was kinda fun. I took her home, and there made a new finger, and re-painted her. The faded eyes were livened up and opened up, her gray hairs were painted over as were her shoes, the absence of eye brows was fixed, and even a little red to the lips to allow them to show up, she looks brand new now with new wings, a new Mexican flag, and yellow roses because Elia is my friend, and the yellow rose symbolizes friendship... it also matches her wings. The calla lily is an important flower in Mexico. Hello, the Co-gin section of the website has been updated! Honestly, that section makes the most sense, I see what the little buggers represent, they are fun, novel, and catchy, they represent the inner child and appear very childlike as well. They really are cute with their semi abstracted forms. I also see how important the inner child can be for us in everyday life, cultivating it, listening to it when it gets upset. 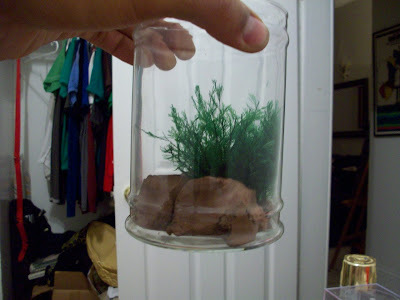 I put up pics of the little things I used to make that were co-gin. Where did the word co-gin come from? Well, just ask my sister and she may tell you a take that involves mus musculus. new section on website called "street vending"
I added street vending to the sidebar on the website, but its really an "events" or "schedule" page where my future vending dates will be posted. Some will be Union Square, others will be the NYC street fairs. I also plan on doing a couple of New Jersey fairs so keep clicking that page! On the bottom of the page are some pictures from street vending last year and beyond, I feel they really capture some of the spirit of the entire endeavor which as I described on the page, is really such a large part of creating the polymer clay people that the vending aspect is just about as important as creating the work, without one, the other doesn't work. My work is also geared towards public consumption, not saying I don't want what I want, or even that I sell out to (literally) sell out, but I make them philosophical for in some way I feel that since people see them even if they don't buy them that I can help instill some of the metaphysical concepts in peoples minds... yes I can save the world one person at a time. I'm very excited, street fairs have always been very good for me, though extremely stressful and with a ton of planning on how to get vehicles ready to drop off/pick up at the location before the time (if you come late, you cannot set up), and also to get picked up in NYC during busy times before the police kick us off the street, but its soo worth it and I cant wait! I will be bringing a lot of small pieces with me that have never before been seen. Lots of sparks, affirmations, and regular butterfly people! Howdy, see, I am capable of creating more blogs. 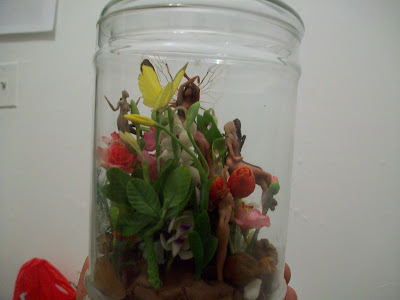 I just finished adding the section on my website in "species/types" for the Affirmations, which are by far my favorite kind of butterfly person for the intricately decorated bodies of the pieces. The pieces also symbolize some ideas about reality that I believe in but may be afraid to express openly so I make them as my scapegoats! I also updated the "sparks" section, but the Madonna video was just a joke. This summer has presented me with my first exposure to the lost wax process under the instruction of Oscar Garcia at the art students league. It is a fascinating thing, making something out of super lightweight, soft, fragile wax will become a heavy, durable, metal object. 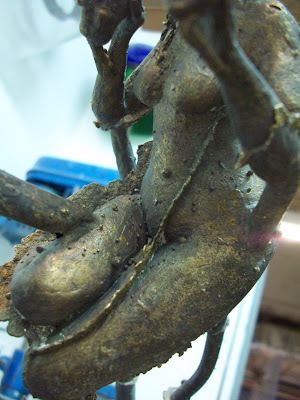 It is not really the wax object at all, but a copy of it, made from the impression or space left in the mold that the wax used to occupy. You can read more about the process on wikipedia. 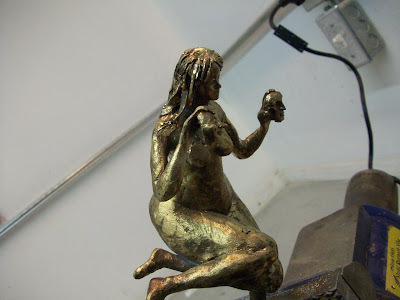 When my sculpture came out of her mold, I was sorely disappointed, I thought she had cast badly with pits, bumps, and flashing all over the place. Also her hair did not cast completely, it was totally missing from the part that was supposed to be behind her neck, only the hair on her head and the hair on her back casted well. 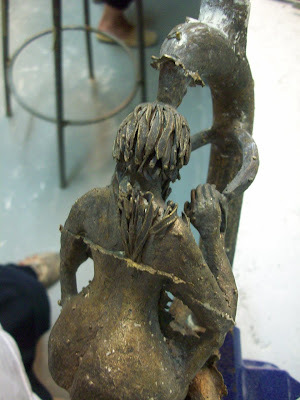 As I began to learn more about bronze and look at fellow classmates work, I could see that my piece was indeed cast very well, with intricate details like the fingers and faces well preserved for the viewer. 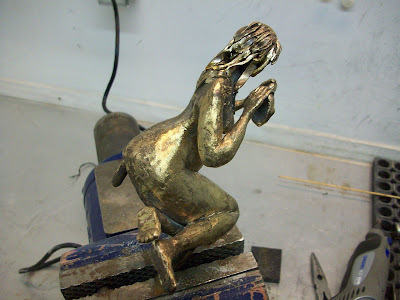 I also found out through working on the piece how easy it is to chase away the imperfections and polish the piece to gold brilliance. 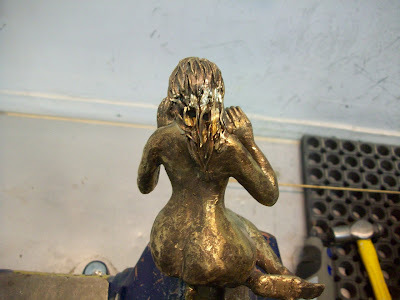 I personally was able to beat some strips of bronze down flat, twist them with pliers, and have the technical instructor weld them onto the piece which you can see in the pictures below the before where hair was missing, and the current which is still being worked on but at least her hair has continuity. 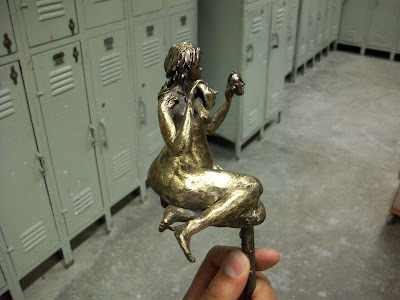 This is my first bronze sculpture, I am very excited about future possibilities with larger projects and perhaps even public commissions (hey, you gotta shoot for the stars I say). Click the images to see texture! The piece has just come out and is a mess, all of this had to be chisled off. Below is the work cleaned up, polished a bit, but still missing the hair. 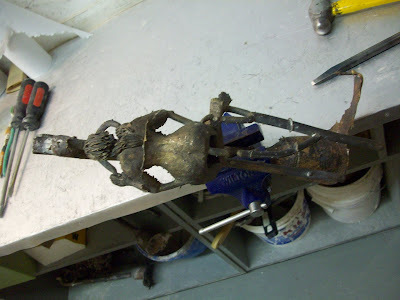 Here some hair has been welded on, but much work went into making it look better, I am still working on her, she is not finished by any means. 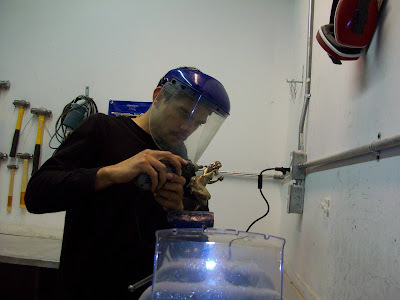 At the studios at the art students league with dremmel tool. 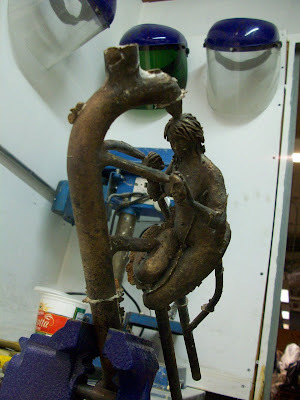 The work of art as currently stands, with the sprue connecting the feet finally sawed off. She will be worked on for the next couple of weeks. The piece holds masks. Although she is seemingly an allusion to the Janus masks of theater comedy and tragedy from ancient Greece, the masks actually symbolize the many faces we "wear" when we need to put on different personalities depending on the situation... I mean, who is the same in an job interview as they are with their mother at home? I have recently gotten my street fair vending permit reinstated and may do some NYC street fairs this summer. 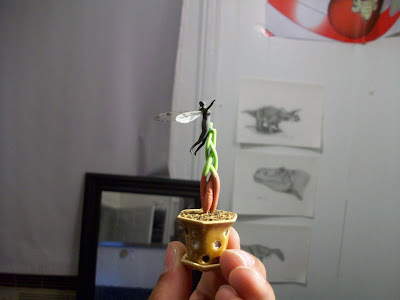 I am transferring my job into New Jersey so that I can cut back on the cost of commuting and also take my working hours down so that I can follow my heart and get back into the swing of vending my polymer clay creations. 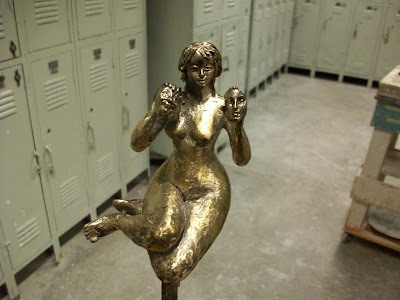 Also I really want to take the ceramic class at City College one more time, but I don't have $700 to do so. I think I am going to just use a credit card and take the class, Its true that I have finished with all my required classes at city college, and don't have to take the class, but I really think that I have a definitive direction now with my ceramic work and just don't have the facilities to make the pottery, at City I would be able to create my art. I am still wanting to go to graduate school, but due to my being quite economically dependent on myself, I may just stay here and go to William Paterson University instead of the big name schools that I wanted to, my existence is currently marred with mountains of debt anyway from my undergraduate studies, including my $10,000 Chase student loan which I have to begin making payments on. No worries though, I believe in manifesting what we want, and soon I will be making oogles of money again, I just have to be active in the process and not idle or caught up with trader Joe's too much. So, simplifying my life, hopefully soon I will be working and living in New Jersey, going to NYC to work at the art students league on Wednesdays and after that taking the ceramics class at city college. 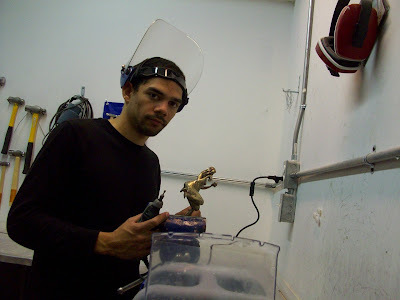 I will also be "taking" the bronze sculpting class at the art students league but most likely making the wax figures at home and only participating in the pour at their north campus when its all said and done. 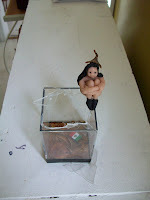 I look forward to also updating this blog more, I think I will make it a point to write in it everyday when I get home, I think about art everyday, I might as well put it out there. 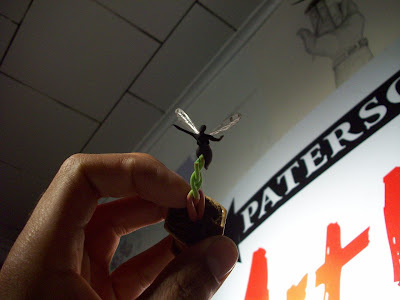 I have made four tiny figures called sparks recently, but only today were they baked, and one even got its wings. 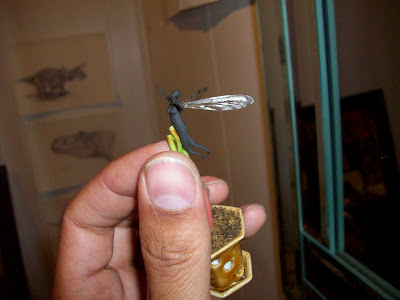 It is the first figure in a very long time that I mounted to look like it was flying. 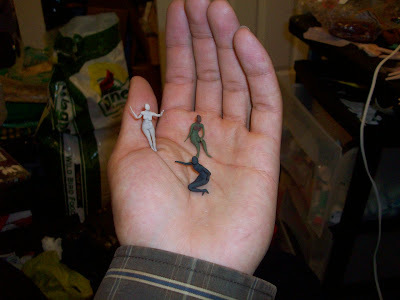 I used to do this all the time with small figures in the past, but now everything old is new again. 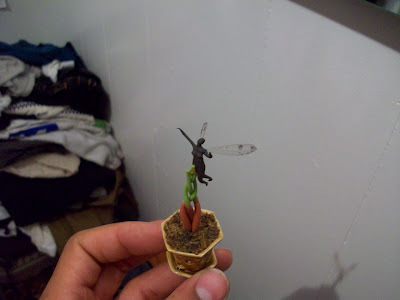 The figure is tiny, and I mean TINY, smaller than almost any other one I have ever done, and it was a pain trying to photograph it so I had to use the flash. You know, I never thought that re-creating my website would be so much fun. I am having a blast. Analyzing the butterfly peeps has made me aware of them and what they are. The new website is super duper under construction but I am posting pieces as I am done with them instead of taking the site down and then re-launching. Today I have began to work on the species section which is really fun, I am going to complete the section on healers and eventually get to the other ones. Also, the purchase -> past works page works where you can see all the old stuff. 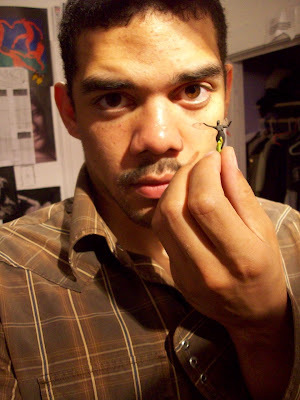 I also put a picture of the first butterfly person I ever made on the “what are they” page. Hang with me and eventually I will have a complete little site with a bunch of musings about the butterfly people which I can share with all those who enjoy my work.